Toledo wrapped up its regular season in fine fashion with a 70-65 victory at Ball State Tuesday in Worthen Arena in Muncie, Ind. Junior Kyle Baumgartner had 14 points, eight rebounds and two assists in the 70-65 win over Ball State. With the win and an Eastern Michigan loss, the Rockets (20-8, 13-3 Mid-American Conference) have secured a share of their third-consecutive MAC West Division title. UT will be the No. 3 seed in the MAC Tournament and play a quarterfinal game on Thursday, March 8, at approximately 2:30 p.m. in Cleveland’s Quicken Loans Arena. Junior Kyle Baumgartner led a season-high five Rockets in double figures with 14 points, eight rebounds and two assists in only 18 minutes off the bench. Baumgartner broke out of a recent scoring slump that saw her with a combined 10 points over the last five games. Joining Baumgartner in double figures were junior Yolanda Richardson (13 points, 9 rebounds, 4 blocked shots. ), senior Courtney Ingersoll (13 points), sophomore Andola Dortch (12 points, 7 assists) and junior Lecretia Smith (11 points, 9 rebounds) to help the Midnight Blue and Gold claim its third straight 20-win season. The last time UT won at least 20 games in three consecutive seasons occurred during the 1996-99 campaigns. The Rockets shot 45.8 percent (22 of 48) from the field, 30.0 percent (3 of 10) from three-point land, and 71.9 percent (23 of 32) from the charity stripe to sweep the regular season series against the Cardinals (9-20, 4-12 MAC) for the second straight year. Ball State hit the ground running and hit five of its first six field-goal attempts, jumping out to a 12-7 lead at the 16:22 mark. Suzanne Grossnickle did most of the damage in the opening moments of the division matchup, converting all four of her field goals for nine points. Toledo fought its way back into the game behind six points from Baumgartner to tie the score at 14-14 with 11:02 remaining in the opening period. Moments later, UT senior Haylie Linn scored four consecutive points to give the visitors their first lead since the opening basket, 20-18, at 8:32 mark. The Cardinals were quick to counter behind the inside presence of Amber Crago and Grossnickle to regain the advantage, 26-22, with 4:41 left in the period. The duo was responsible for six straight points to force UT into a timeout. UT responded well following the stoppage of play and ended the half with a 12-2 burst to take a 34-28 edge at the intermission. Baumgartner was again the workhorse in the waning moments of the period, scoring six points in the run to establish a two-possession lead at the break. The 2011 WNIT Champs received a pair of triples from Dortch and six points from Richardson to open up a 51-42 cushion with 11:20 left in regulation, forcing BSU into another timeout. The Rockets maintained at least a five-point lead until BSU’s Brittany Carter drained a deep triple to make the score 58-55 with 3:01 showing the clock. UT would not allow BSU to get any closer, though, hitting 12 free throws over the final three minutes to make the final score 70-65. Ingersoll was a perfect eight for eight from the charity stripe to aid Toledo in winning consecutive games in Worthen Arena for the first time since 2003-04. The Rockets posed for a photo with the 2012 Mid-American Conference Swimming and Diving Championship trophy. The University of Toledo swimming and diving team members are champions in the water and in the classroom. The team has achieved Scholar All-American status for fall semester, the College Swimming Coaches Association of America announced this week. The team posted a combined 3.450 grade point average during fall semester. The College Swimming Coaches Association of America presents the Team Scholar All-American award to college and university swimming and diving teams that have achieved a cumulative GPA of 3.0 or higher. 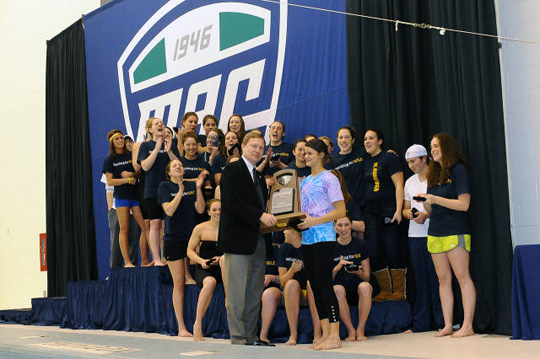 The scholastic recognition comes days after the team won the 2012 Mid-American Conference Swimming and Diving Championship at the University of Akron’s Ocasek Natatorium. The Rockets scored 635 points to beat runner-up Ohio University (612 points) and win their second conference title in three years and second in program history. Five UT swimmers earned first-team All-MAC accolades, while two others were named second-team All-MAC. Hinkleman was named the 2012 MAC Coach of the Year. A complete listing of all institutions that achieved Scholar All-American honors can be found at www.cscaa.org. Diane Hazrilla has chosen to give up lazy days on the couch for a more fulfilling spring break experience. She is one of about 30 UT students who have chosen an alternative spring break trip to New York City to volunteer and serve the community. The American Language Institute and the Leadership Through Service Living Learning Community will travel and work together for the first time to participate in an alternative spring break trip in the Big Apple. UT’s spring break is Monday through Friday, March 5-9. As part of the 2012 trip “Homelessness and Hunger,” students will volunteer for the week at various homeless shelters in New York. When volunteering, students are encouraged to reach out to those in the shelter and learn about their circumstances revolving around their current living situation. The Leadership Through Service Living Learning Community provides an opportunity for students to make their first year at UT exciting, supportive and unique while connecting with like-minded peers who are energized about outreach. As part of the program, students must complete at least 300 hours of community service and are awarded $1,000 toward their education at UT. The American Language Institute was founded in 1978 as an intensive English program at the University. The institute offers exceptional English language classes to students from all over the world as well as local residents and businesses. The program features reading, writing, listening and speaking skills practiced in units about interesting topics and grammar instruction about the English language. The goal of the alternative spring break program, along with all programs in the Center for International Studies and Programs, is to encourage students to step outside their comfort zones and seek diverse initiatives that will equip them to be change agents for the future, said Dr. Sammy Spann, executive director for the Center for International Studies and Programs. The fish consumption advisory — with the exception of carp — for the Ottawa River in Toledo, including the portion that flows through The University of Toledo, has been ordered lifted by the Ohio Department of Health and the Toledo-Lucas County Health Department. This advisory originally was issued by the Ohio Department of Health in 1991. It resulted from the decades of manufacturing activity and improper waste disposal of hazardous substances in the Ottawa River and its watershed. The “do not wade or swim” contact advisory previously was lifted for the western half of the Ottawa River, which includes the portion that flows through The University of Toledo Main Campus, in 2010. An advisory to not eat the carp in any section of the Ottawa River remains in effect. Officials with the Toledo-Lucas County Health Department, The University of Toledo and the Ohio Environmental Protection Agency will gather at 1:15 p.m. Wednesday, Feb. 29, to remove an existing yellow warning sign located on the north side of the Ottawa River by the footbridge behind Carlson Library. In the event of rain, the press conference will be held in Student Union Room 2582. The UT President’s Commission on the River plans events annually for Celebrate Our River Week that includes joining the community-wide Clean Your Streams campaign with volunteers pulling trash from the waterway. The University is in the process of an Ottawa River restoration project funded with grants from the Ohio Environmental Protection Agency and the U.S. Fish and Wildlife Service. The project will use natural materials to create changes to the river flow that will enhance the aquatic habitat. Restoration plans are expected to be finalized in April with improvements beginning this summer. The Toledo men’s basketball team will host Eastern Michigan Saturday, March 3, at 2 p.m. in Savage Arena in a game that could determine the West Division champion of the Mid-American Conference. Special $6 general admission bleacher tickets — $3 for UT employees — are on sale for this game. Also, groups of 15 or more can purchase tickets for just $3 per ticket. Group tickets must be purchased by Friday and are based on availability. 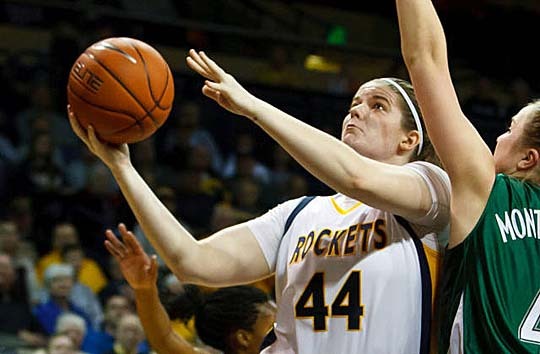 Toledo (15-14, 6-8 MAC) is tied for second place in the MAC West, two games behind EMU (13-16, 8-6 MAC). If the Rockets win on the road at Northern Illinois on Wednesday and EMU falls at Western Michigan, then UT could earn a share of the crown by beating the Eagles Saturday. Also, a Toledo win vs. NIU or a Miami loss at Bowling Green Wednesday will clinch a first-round MAC Tournament home game for the Rockets on Monday, March 5, at 7 p.m. Tickets for that game would go on sale at 10 a.m. Thursday, March 1. Call 419.530.GOLD (4653) to purchase tickets or for more information. Celebrity waiters, raffle prizes and a live auction will be a few highlights of the Catharine S. Eberly Center for Women’s fourth annual Celebrity Wait Night fundraiser Thursday, March 1, from 6 to 9 p.m. at Parkway Place, 2592 Parkway Plaza, Maumee. During the event, local celebrities will wait on tables; servers will include Toledo Mayor Mike Bell, State Rep. Teresa Fedor, UT Women’s Basketball Coach Tricia Cullop, UT Vice President for External Affairs Lawrence J. Burns, ABC 13 Reporter and Anchor Kristian Brown, and Toledo Public Schools Superintendent Jerome Pecko. Last year, more than 270 people attended Celebrity Wait Night, and organizers are expecting even higher attendance this year. Tickets are $40 per person to cover the cost of the meal. All the money raised from tips, the raffle and auction will go to fund Eberly Center initiatives, including the Women’s Success Series. Monies raised also will support the new Eberly Center Resource Room, which provides access to a computer, phone, fax machine and other office supplies. For more information, contact the Eberly Center at 419.530.8570. Departments in need of guest parking passes now can use the online parking system to sign up visitors to park on campus. In the past, department representatives needed to contact Auxiliary Services and receive either a date-stamped white one-day paper pass or a blue multi-day permit for visitors. That system has been automated with the rest of faculty, staff and student parking permits. The first step is for a department representative to complete the online form available at utoledo.edu/parkingservices to establish an account. The accounts require a department email address rather than an individual email, which already is tied to an individual parking permit account. If you need a departmental e-mail, contact the IT Help Desk at 419.530.2400, 419.383.2400 or ithelpdesk@utoledo.edu, or click here. Once the form is complete, email it to parkingservices@utoledo.edu. An account will be set up and a confirmation email sent to the department account with a temporary password allowing access to the system at guestparking.utoledo.edu along with a step-by-step guide to add guests. Once the account is set up, the department can log in with that email and password to add guest passes whenever necessary. The department guest passes are valid for one to three days and can be secured up to 10 days in advance of the visit. The same vehicle information is needed as is for faculty, staff and student passes: license plate number and make, model, year and color of the vehicle. All requesting departments will be granted access to issue the day guest passes; those divisions with need for guest passes for longer amounts of time, such as for contractors or sales representatives, need to make a note of that in the comments section of the Departmental Parking Guest Request Form to be granted additional access. There is no charge for the departmental guest parking passes, which are the equivalent of an A Pass. Any citations associated with a department guest permit will be the responsibility of the department that brought the guest on campus. “We are pleased with the progress we have made including all types of parking passes into the automated system that allows the University to move away from the hanging tags and paper permits of the past into an online system that is more convenient for people to access and update,” said Joy Gramling, director of auxiliary services. The departmental guest permit system went live mid-February following the individual guest parking registration system earlier in the month. Individual guest passes are $3 per day and are available at the same website, guestparking.utoledo.edu. A personal email address is needed to create a guest account. Individual guest passes are the equivalent of a C Pass and are available for up to five consecutive days. For more information, visit utoledo.edu/parkingservices or contact parkingservices@utoledo.edu. A team representing the Higher Learning Commission (HLC) of the North Central Association of Colleges and Schools will be on Health Science and Main campuses through Wednesday, Feb. 29, as part of UT’s continuing accreditation process. Monday, Feb. 27, at 4 p.m.
Monday, Feb. 27, at 4:30 p.m.
Tuesday, Feb. 28, at 11 a.m.
Tuesday, Feb. 28, at 4 p.m. 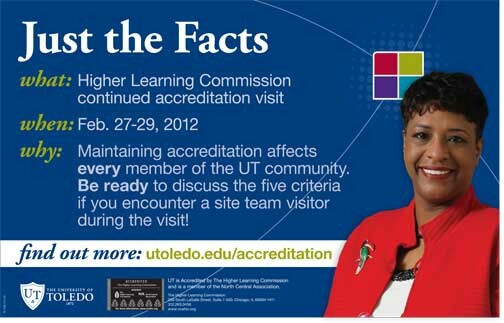 The forums will serve as opportunities for members of the HLC team to verify and expand on information presented in UT’s self-study report, available at utoledo.edu/accreditation/pdf/selfstudy.pdf. The self-study is based on evaluation of UT’s achievement in five key criteria determined by the HLC: mission and integrity; planning for the future; student learning and effective teaching; acquisition, discovery and application of knowledge; and engagement and service. The HLC team will meet with administrative leaders Wednesday morning to present preliminary comments regarding of the site visit. More comprehensive information will be released throughout the next few months and reported in UT News. The Toledo swimming and diving team entered day three of the Mid-American Conference Championship in first place and that’s where the Rockets finished, winning the 2012 MAC Swimming and Diving Championship. 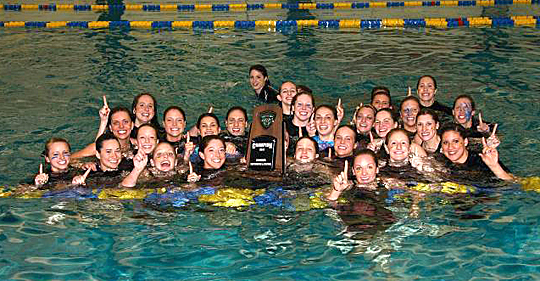 The UT women's swimming and diving team won the Mid-American Conference Championship in Akron. With five swimmers earning first-team All-MAC honors and two others earning second-team All-MAC, UT scored 635 points to out-duel rival Ohio, which finished second with 612 points. After ending the first day in third place, trailing leader Ohio by 80 points, Toledo came up huge on the second day, scoring 236 points to jump into first place. Counting all three days of the championships, the Rockets won nine events and set numerous pool, school, meet and conference records. In all, they set eight pool records, five championship meet records and four MAC records to go along with 12 school records. UT held an 11-point lead heading into the final day, but Ohio was able to regain a 523-496 advantage following a 1-2 finish in the 200 backstroke and scoring four swimmers in the 100 freestyle. Toledo quickly recovered by placing three swimmers in the top eight of the 200 breaststroke and two swimmers in the top five of the 200 butterfly, providing a 595-544 lead. Toledo held on throughout the final two events to bring home the victory, 635-612. To start the final day, Claire Leichty successfully defended her title in the 1650 freestyle, winning in a meet record time of 16:11.80. Providing depth in the 1650 free were Rachel Johnson (fourth place, 16:34.18), Louise Smyth (fifth place, 16:35.56), Kristen Clemmons (12th place, 17:03.57) and Gillian Staudt (15th place, 17:10.65). Christina Noens swam to a third-place finish in the 200 backstroke in 1:58.47 (NCAA ‘B’), and Maria Bargardi placed seventh in 1:59.58. Carly Harter placed second in the 100 freestyle in 49.75. Laura Lindsay doubled up as an individual conference champion, taking first in the 200 breaststroke in 2:09.79, breaking the pool record, meet record and MAC record. LesLee Winfield placed fourth in a time of 2:17.00. Also scoring points were Meredith Gibbon (eighth place, 2:20.61) and Melissa Auckley (11th place, 2:17.87). Beth Rogers won the 200 butterfly in 1:57.87, breaking the pool record, meet record and MAC record. McKenzie Bagan placed fifth in a time of 2:01.46. Nicki Schropp placed seventh in the three-meter dive, scoring 305.75 points. She was the first Toledo diver to score points in four years. The win marks the second conference championship in three years for the Rockets, and the first for Hinkleman, who is in her second year at the helm of Toledo swimming and diving. Clara Church, 8 years old, tetanus, Jan. 29, 1859. Chris Fall, 35 years old, laborer, drinking ice water, May 15, 1860. John Ayers, 32 years old, bad whiskey, June 3, 1863. Theodore Hansen, 27 years old, soldier, starved in Rebel prison, April 3, 1865. Ada Meeker, 1 year old, cholera infantum, Sept. 24, 1865. Susanna H. James, housewife, 23 years old, typhoid fever, Jan. 23, 1866. These brief entries recorded in the pages of the Record of Deaths in the City of Toledo are more than just statistics. Individually, they hint at lives tragically cut short. Collectively, they tell the story of the difficulties of survival in Toledo in the middle of the 19th century, and the state of medical care in the city at the time. 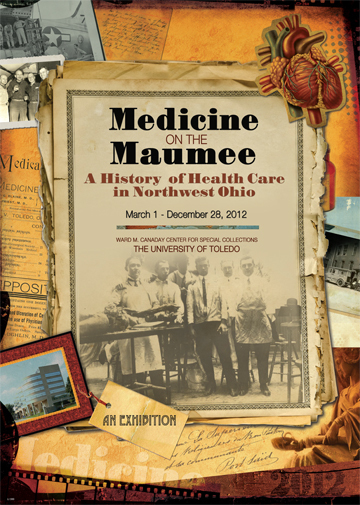 The exhibition titled “Medicine on the Maumee: A History of Health Care in Northwest Ohio” will open Thursday, March 1, at 3 p.m. in the Ward M. Canaday Center for Special Collections in The University of Toledo’s Carlson Library. The free, public exhibit traces the history of medicine in our community from the earliest years of settlement to current day. It looks at epidemics that devastated the population, hospitals that sought to cure, doctors and nurses who provided care, and at how medicine became an industry. In addition to items from the Canaday Center’s holdings, the exhibit will incorporate articles borrowed from many local organizations, including Mercy, Mercy College, ProMedica, the Toledo-Lucas County Public Library and the Rutherford B. Hayes Presidential Library. The exhibit will present a unique opportunity to see rare medical history-related items that are not likely to be brought together again in a single exhibit. 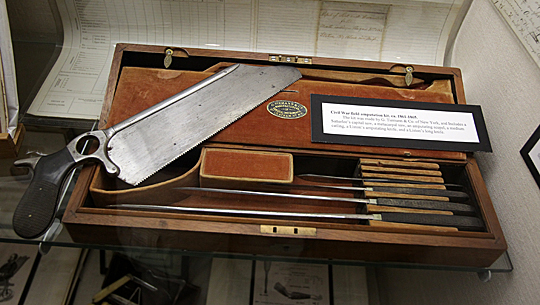 This Civil War field amputation kit circa 1861 to 1865 was made by T. Tiemann & Co. of New York and from a collection of historical medical instruments acquired by the former Medical College of Ohio and now housed in the Canaday Center. Included in the exhibit will be early documentation of medicine in northwest Ohio, including a patient logbook from Dr. Frederick William Jaeger, who practiced medicine in Woodville in the 1840s and 1850s. The logbook is being lent to the exhibition by the Harris-Elmore Public Library. The exhibit’s opening presentation will be a “living history” re-creation of Jaeger, done by his great-great-grandson, John Jaeger of Perrysburg. Jaeger’s “Black Swamp Doctor” interpretation discusses some of the diseases that were rampant in the early settlements of the region, the plants and medicines used to treat them, and care provided by doctors of the time. Jaeger, who was a naturalist and interpreter for Metroparks of the Toledo Area before his retirement, has won awards for his “Black Swamp Doctor” re-creation. In addition to early patient logs, the exhibit will feature the minutes of the Academy of Medicine dating back to 1864; these records reveal much about the practice of medicine in the region. Also included are patient logs dating back to the founding of Mercy Hospital and Mercy St. Vincent Medical Center; newsletters written by patients at the William Roche Memorial Tuberculosis Hospital; photographs and scrapbooks documenting now-defunct hospital nursing schools; letters from Civil War doctors from northwest Ohio; and founding documents of the Medical College of Ohio. The topic of public health will be addressed, and the Toledo-Lucas County Department of Health has loaned its earliest volume of death records from the city of Toledo dating from 1858 to 1871. The records provide a fascinating glimpse into life — and death — in the early years of the city’s history. Also included are rare medical books, including a first edition of Dr. Daniel Drake’s A Systematic Treatise on the Principal Diseases of the Interior Valley of North America, published in 1850. Drake’s study included documentation of the Black Swamp in northwest Ohio and its impact on disease and medical care in the years immediately following the settlement of Toledo. An extensive catalog to accompany the exhibit is available free. The catalog was a cooperative project of the staff of the Canaday Center and archivists and librarians from Mercy, Mercy College and ProMedica. The exhibit will be open Monday through Friday, 8 a.m. to 5 p.m., and by appointment through Dec. 28. Group tours also can be arranged. To accompany its “Medicine on the Maumee” exhibition, the Canaday Center will feature an exhibition of anatomical specimens and medical illustrations prepared by members of UT’s Health Science Campus. “Anatomical Art: The Internal Beauty of the Human Body” will be on display in the art gallery area on the fifth floor of Carlson Library adjacent to the center. For more information, contact Floyd at 419.530.2170.